This might be confusing, unless you know that science fiction author James S.A Corey, known for the Expanse series (starts with Leviathan Wakes), is the pen name of two authors, Daniel Abraham and Ty Franck. Leviathan Wakes is the first book in the Expanse series. Now that that’s out of the way, both authors recently visited Powell’s Books for a great Q&A session, followed by book signing. Even a Wookie showed up! In the forefront of everyone’s mind was the plans for the TV show. The Expanse series was recently picked up by the Syfy network and it’s currently in development. He did however lay to rest fears that, “Omigod, they’re going to Sharknado it,” saying that him and Ty are “delighted” and “so spiffed” to be working with the network. Ty says hopefully it won’t be “stuffed shirt white guys in space,” but in fact, most changes that have been proposed so far are ones that they wish they had thought of themselves! With that out of the way, questions turned to the books themselves, with slight distractions from the Stormtrooper that was passing the mic to people with questions. A few members of the local chapter of the 501st Legion showed up, which added to the fun. During the event, we found out that the world building process was because it was originally designed to be a game in the tradition of Dungeons and Dragons…. but in space. All that careful world building and detail is apparent in the writing. 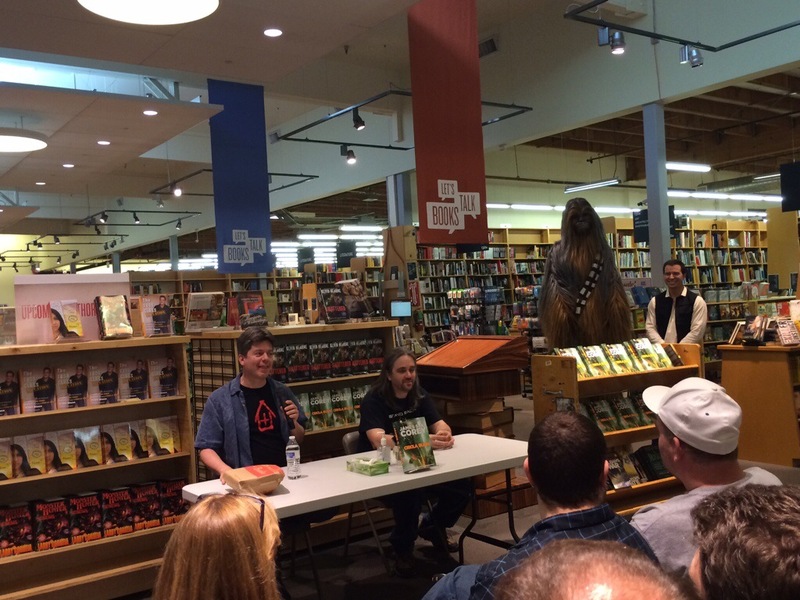 A 7 foot Wookie might have threatened to upstage them, except that Daniel and Ty were so engaging that everyone was focused on the authors. In the end, they try to write something accessible so even non-science fiction fans can “come play too.” After all, if their books are “the gateway drug, we win,” says Daniel. In light of the recent Ebola epidemic in Africa, the authors do want to point out that the “vomit zombies” are real, being based on the last stage of Hemmoragic fever. “We were afraid of it [Ebola] before everybody else,” Daniel added. Daniel Abraham has noticed that in his books, a “really, powerful middle-aged woman” keeps showing up “like a familiar actor.” She shows up in the Expanse series too— can you identify her? In Caliban’s War, the second novel in the Expanse series, the authors deliberately swapped traditional gender roles. They know the last line of the last book in the Expanse series already, but Ty and Daniel don’t know what book number that is. During the editing process, references to numbers or times, like “it took 7 weeks to get there” are deliberately removed and replaced with generalities “it took weeks to get there.” Likely because of fandom— someone is bound to calculate things based on the described universe. A lot of science fiction deals with “early stuff” where humans are just flying out to other planets, and “late stuff” where humans have conquered the universe. The Expanse series is designed to take place in that middle period right when humans are starting to expand out. If you like epic space things, pick up the Expanse series. And if you ever get a chance to meet or hear Ty and Daniel speak, don’t miss it—it’s bound to be a ton of fun! Space is a big and unforgiving place.